...makes a fair bit of difference. Definitely brightens the place up! But... but... Sandtex is exterior grade paint - you do realise you will now die from the fumes leaching out over the next few years? That's just a single 11w LED portable worklamp from Screwfix I used whilst painting at night. I'm not going to need much more lighting, methinks. One warm overhead for when just putting the bikes away and getting stuff off the racking, then a few white strips over the work area and either side of the front section switched separately. I agree with that. It makes a real difference. "Liquid lino" or similar. Aye, the floor will be done. Not sure of my budget yet. I bought this sort of thing and 20l was enough to do a single and a double garage with two coats. Best thing you can do to brick shed walls is white paint - brightens it and needs less lighting fitted in the end. Makes a good clean surface and gives contrast behind shelves that allows things to be found easily. I always use old leftover emulsion for that because of the initial absorption. Smashing job. Nice garage. Still waiting for mine to be built. For some reason is miss read it as one coat of spandex , I was expecting some nsfw pics. How much are electric roller doors these days? I'll be needing a new frame on mine (rotten at the bottom) so that'll add a bit extra to things. Can they be operated if the power goes off? no side door on mine. I've done my garage floor in plastic tiles by Plasfloor. Single garage cost about £250 iirc. Marginally more comfortable underfoot, dropped tools less likely to be damaged and no concrete dust. I went for yellow ones which seem to make the place seem a bit brighter. Also, if you can cut some French cleat strips for the wall you can hang stuff all over and easily re-arrange. I used Sketchup to plan out how many I would need and they were pretty heavy. They turned up on a pallet. They've been down for two years now and are surviving fairly well. Sort of wish I'd put down that thin underlay for a bit more insulation and sound-deadening, but not enough to go lifting them all. The light grey ones have discoloured slightly where I ride dirty bikes onto them all year round, but the floor is much easier to sweep and mop than bare concrete. I do use side stand pucks to stop the stands sinking in, but where I've dented the tiles with center stands the marks have vanished after a while. How much are electric roller doors these days? I'll be needing a new frame on mine (rotten at the bottom) so that'll add a bit extra to things. Can they be operated if the power goes off? 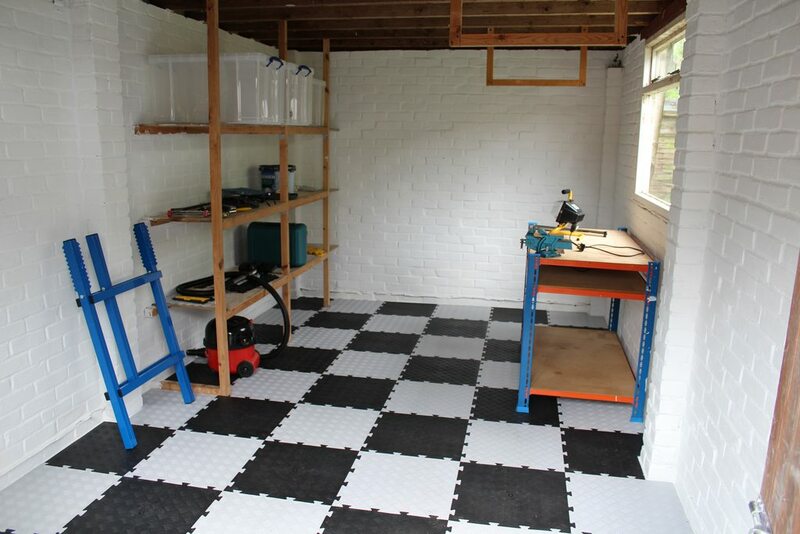 I've done my garage floor in plastic tiles by Plasfloor. Single garage cost about £250 iirc. Someone sells heavy duty floor paint on gumtree for £40 for 20L, and will deliver too - don't know if that ups the price or not tho. Yip, always go for industrial floor paint, avoid domestic stuff as even the trade paint isn't tough enough to deal with shoes let alone tyres. If painting a concrete floor, then Ronseal diamond hard floor paint is good stuff. It been fine in my garage for 6years, and with cars and bikes in-out frequently. What matters other than paint quality with painting any concrete floor is preparation. You absolutely can't expect any paint to adhere well to a dusty oily rough floor. You need to remove dust and seal the concrete with a good concrete sealant, and also try to level the surface as much as possible. Only once this is done will floor paint be suitable for the surface and have any chance of being a durable tough finish. If working on the floor at all though, you want a soft and warm surface. In my shed I've got kitchen lino over plywood sheet that's on top of 12mm thick polystyrene sheet. Its far nicer to stand or kneel on than concrete. You need to remove dust and seal the concrete with a good concrete sealant, and also try to level the surface as much as possible. Aye, I'm taking the pressure washer and degreaser over to attack it at the weekend, and then seeing what condition it's really in. If you raise up the leg braces on that pallet bench you can slide stuff under it AND have a shelf for storage. Good idea - it's about 3" too wide to slide under the window between the brick uprights, so I'll be trimming it down an putting a ply surface on anyway. Triumph1300 This post is not being displayed . Do you want my GT550 to put in that space?? ?